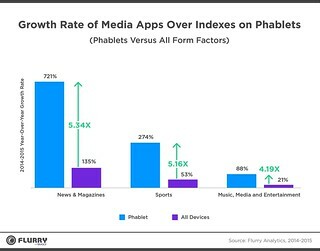 Flurry, a former USV portfolio company now owned by Yahoo!, put out a mobile report yesterday and there’s some interesting data in there. Flurry has its analytics on over 2bn devices around the world so they see a lot of activity. 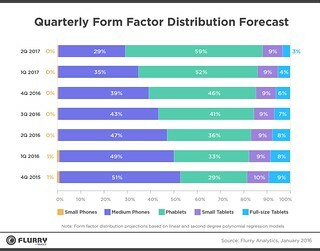 It’s very much a normal distribution centered around the 5.5″-6″ mobile phone (phablet). 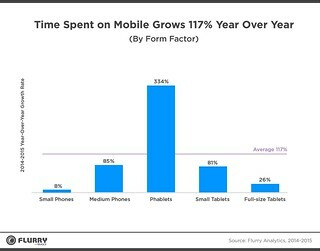 There are still some people out there using smaller mobile phones and small tablets, but much of the world is converging around a single large phone. That makes sense. Four of the five members of my direct family have made that move and it’s a matter of time for the lone holdout, my oldest daughter. Newer post The Co-Founder Bootcamp Older post Is It The Content Or The Packaging?